Act #139: Keep compassion simple. Yesterday I drove two hours, stood in line for an hour and a half, and sat and waited for two more hours - in seats so crammed together there wasn't enough room for me to even cross my legs.... just to hear Tenzin Gyatso, the 14th Dalai Lama speak for 45 minutes. Worth every second. Here's what I learned. 1. You can be holy and funny at the same time. When you exude truth with every fiber of your being, you can also be a 78-year old Asian man in a bright orange robe, a matching visor, and over-sized sun glasses and still have 15,000 people hanging on your every word. What I will remember most about my experience with the Dalai Lama is the deep, rich, heartiness of his laugh and it's unspoken powers to calm and connect those of us lucky enough to be in his presence. 2. Monks have more in common than their religion. His holiness spoke at length about the time he spent with Trappist monk, Thomas Merton. He recalled fondly spending 3 hours every day with him for 3 days, drinking tea and comparing daily rituals of Tibetan monkhood and Christian monkhood. They discussed how faith was powerful enough to transform the human experience, and they had unwaivering confidence that their respect towards other faiths only made stronger, their commitment to their own. 3. We have more in common than our religions. 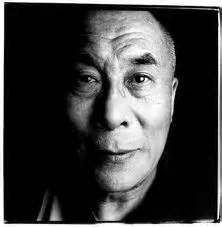 The Dalai Lama repeatedly stressed that all religions (should) practice compassion and strive for harmony. He urged us not to let religion be the force that separates us. We need each other - the physical survival of human beings is based entirely on the care and compassion of others. We should all meditate on love. The Dalai Lama accepted the "limitations of prayer" and while he did not minimize the importance and sacredness of it, he believed that to truly engage in compassionate living, one must not only pray, but act accordingly. 5. Human beings make everything too darn complicated. At the end of his talk, audience members lined up behind a microphone to ask the Dalai Lama questions. They asked about capitalism, forgiveness, poverty, and his views on environmental issues. They were smart, highly educated (if I had to guess), and articulate. They were all white. And I dare say that most of the global population that they referenced in their questions, would not be able to relate to them. The single most important thing that I learned last night is that compassion is simple. We're the ones that try to make it a complex theory, philosophy, when in reality, it just is what we should all do, practice, be. 6. That is all. That is life. Go ahead and take a moment, and let that sink in.